This post is for my cousin, who is not vegetarian, but is feeling the need to get more veggies and home-cooking into her diet while having absolutely no idea how to approach a spice rack or a Whole Foods store. We all need to get more fresh foods into our diets, and vegetarians are no exception. Many new vegetarians especially, fall into the trap of eating just as many processed foods after going veggie as they did before hand. Simple, changeable and quick: stir-fry is the best way to begin introducing new, fresh veggies into your diet without having to get too far out of your cooking comfort zone. Though you can put any vegetable, any “meat,” any spices and any sauces that you want into a stir-fry (hence their versatility,) I am currently loving Asian sauces and a little marinated tofu. (Shrimp would be my suggestion for my non-veggie cousin…much healthier than beef strips.) Some supermarkets even sell packages of “stir-fry vegetables” in their produce section which usually include bell peppers, mini corn, carrot strips, bean sprouts and pea pods. There are tons of store-bought stir-fry sauces to choose from out there. Of course, you could also make your own sauces. Some sauce options include: ketchup-vinegar-honey, orange juice-mint paste-olive oil, peanut sauce-soy sauce, terriyaki sauce-rice syrup-water, white wine-tomato paste-honey etc, etc… The list could go one forever. If you like it, try it. I hear that blueberry jam with white wine and vinegar makes a nice sweet-n-sour stir fry sauce, I’ve gotta try that someday. As for what to pair your stir-fry with, it is best paired with a starch of some kind. Jasmine and Basmati rices are my favorites, but noodles are a good bet too, and rather more exotic looking on the plate. 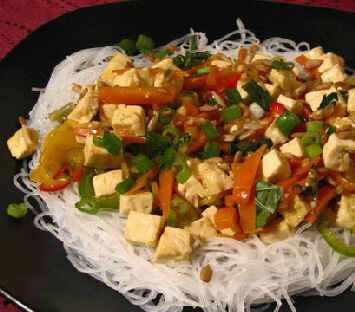 Try sweet potato noodles, buckwheat noodles and any other kind of Soba or rice noodle, most of which can be found in the International Foods section at a large grocery store. 1. Take the brick of tofu, cut it in half (if you use more than half it will be too much) and then cut it in strips about 1/4 – 1/2 wide. Proceed by cutting these strips into smaller chunks or cubes. 2. With a little olive oil, fry these cubes in a skillet on medium heat until they get just a little bit brown on the edges. This helps to keep them firm when adding them to the stir fry later. 3. Place the cubes in a dish or bowl, cover with the sauce mixture, in this case sweet chili sauce and soy sauce (see below,) and marinate for 1-2 hours or longer if desired. 1. Begin cooking your starch in a pot. For non-vegetarian readers, also begin by frying any meat that you are adding to the stir-fry. 2. Once there is only five or ten minutes left until your chosen starch (rice, couscous, noodles etc.) is finished cooking, you can begin by heating olive oil in a pan. I use a lot, maybe 5 tbspn. 3. Add the hardest, or densest veggies first…ie. the zucchini and the carrot strips. These will take the longest to cook. Do NOT cook them until softened, as stir-fry is meant to result in medium-cooked veggies, not well-done. 4. Once the first veggies start to soften, or change color, it is okay to add the rest of the veggies, extras, spices and herbs, if any. Hold off on adding the sauce and tofu until later. 5. Stir-fry on medium-high heat until you feel that the veggies have reached a level of cooked that you desire. 6. Add the sauce mixture and stir. Also add the tofu and continue frying on low heat for an additional 2-3 minutes until tofu is warm. 7. Serve the stir-fry with your starch and a nice wine. Bon Appetit! Though stir-fry is essentially easy, getting veggies the right consistency, in other words NOT over-cooking them can, take a while to master. Real Asian stir-fry is cooked at very high temperatures, generally in a wok, which allows them to achieve a “flash fry” of the veggies. You can get the same effect at home in a regular skillet, but it will take a few tries to master the timing and temperature. Your stir-fry will still be just as tasty even if the level of cooking is a bit off. Enjoy yourself and experiment! I wanted you to know- only because it was a surprise to me and I want everyone to know- Soy Sauce is loaded with MSG. However, minus the soy sauce- this is an awesome recipe!! This is somewhat true, however if you make the effort to use organic Nama Shoyu it will contain only naturally occurring traces of MSG, as opposed to high additives of chemically created MSG. As naturally occurring MSG in non-toxic in small amounts and, as the amount of soy sauce in this recipe will have you ingesting less MSG than you find in a single can of Campbell’s soup, I wouldn’t worry about it.